Sutley led the White House Council on Environmental Quality from 2009 – 2014. 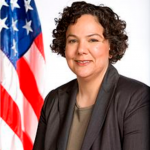 Prior to being confirmed by the Senate to lead the CEQ, Sutley served as deputy mayor for Energy and Environment in Los Angeles, California, and as Mayor Antonio Villaraigosa’s appointment to the board of directors for the Metropolitan Water District of Southern California. Sutley has committed more than 20 years to protecting public health and the environment, and to energy and climate change issues. She has also devoted much of her career to public service. In July, 2014, she was appointed as Chief Sustainability and Economic Development Officer for the Los Angeles Department of Water and Power. Sutley served as a member of Hillary Clinton’s Southern California Lesbian, Gay, Bisexual and Transgender steering committee. She was also a prominent supporter of Senator Clinton’s primary campaign. In addition, she supported a requirement for Los Angeles to produce 20 percent of its power from renewable sources. From 1999 to 2003, she worked as deputy secretary for policy and intergovernmental relations at the California Environmental Protection Agency. She furthered her environmental career as a member of the California State Water Resources Control Board and as the top energy advisor to former Governor Gray Davis. Sutley received her Bachelor’s degree from Cornell University and her Masters in Public Policy from Harvard University.